These BPA free sports bottles hold 20 oz of your favorite bevvie. They are FDA certified safe for use by children aged 3+. Locals can pick up or I'll drop them off. Shipping will be an additional $2.00 for 1 bottle, $2.60 for 2, $3.30 for 3. All proceeds will be donated to the March of Dimes! Use the above Paypal button to order yours today. Checks can be made out to Alliance Credit Union. Please write Pirate Power on the memo line! If you would like to designate which items you would like us to purchase with your donations, leave us a note as you complete your donation. If you would like to donate a bag in honor of a loved one, please let us know. We will enclose a card in the delivery and notify you when the bag has been donated! 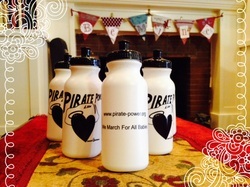 Pirate Power is funded entirely through donations from our supporters. We mail NICU Support and Baby Loss Comfort Bags all over the country, free of cost. We estimate that each bag costs $25 to complete. We are always grateful for donations that will help us fund our mission. We fundraise all year long in an effort to pay for our domain fees, post office box, informational flyers, and postage. You can donate online, using the Paypal button above, or by mail. Thank you for making a difference for NICU Families and those that have lost a little one.